for the ice to start breaking tree limbs again. This time, I'm semi-prepared. At least I have a bunch of water and propane. This is a picture of The Boy almost exactly four years ago. He is modeling a pair of alligator mittens and slippers. They were a gift from his Papa, who thought they were dinosaurs. Seeing this makes me cry for some reason. Okay, I'm wiping my tears and tagging Ericka, Sonya, Heather, and Lisha. Oh, so cute! (Especially love the face he is making.) How quickly they grow. Tears, because he's so unbelievability cute. I can only repeat what the others have said: he is sooo cute! So adorable! 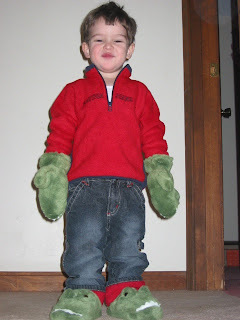 I love those Crocodile mittens and slippers!